WASHINGTON, DC, February 13, 2012 (ENS) – Starting at noon today, a coalition of more than a dozen environmentally-concerned organizations and businesses set out to gather at least 500,000 signatures on a petition opposing the Keystone XL pipeline and urging Senators to block amendments to the transportation bill that would reverse the President’s pipeline rejection. On January 18, President Barack Obama determined that the 1,700-mile pipeline proposed by TransCanada to carry tar sands oil from nothern Alberta to refineries in Oklahoma and on the Texas Gulf Coast is not in the national interest. On Monday night, just under seven hours into the 24-hour petition drive, environmental and public interest groups reached their goal of sending the Senate over 500,000 messages opposing the Keystone XL tar sands pipeline. 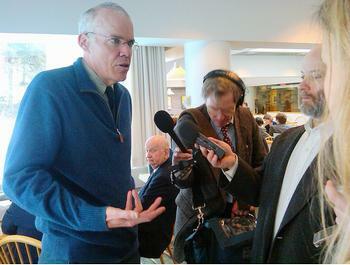 Bill McKibben of 350.org will be on “The Colbert Report” television show tonight to update the number of signatures collected. McKibben was a primary organizer of Keystone XL protests last summer and fall outside the White House, where more than 1,200 people were arrested over several weeks. Another attempt by Congressional Republicans to resurrect the Keystone XL pipeline began this morning, as debate of highway funding legislation opened in the Senate. Republican Senators John Hoeven of North Dakota, Richard Lugar of Indiana and David Vitter of Louisiana are heading a group of more than 40 senators behind legislation to approve the Keystone XL pipeline project under Congress’s authority in the Commerce Clause of the U.S. Constitution, Article 1, Section 8. 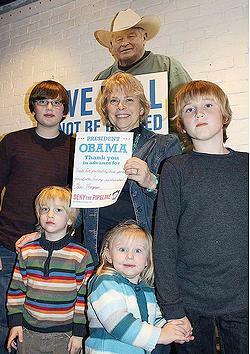 Senator Lugar said, “President Obama’s most recent failure to help grow private sector jobs was his decision to block construction of the Keystone XL oil pipeline. I wrote the bill trying to stop him from delaying a decision until after the election and I will continue to work toward reversing his obstruction of this secure fuel supply. The Keystone XL pipeline would create 20,000 jobs including those from Indiana involved in supplying the project. A vote on the amendment is not guaranteed in the Democratic-controlled chamber. Keystone XL supporters in the House of Representatives last week introduced a bill (H.R.4000) identical to the Senate bill, but even if both houses of Congress were approve it, President Obama will almost certainly veto the measure. The bill allows the company to move forward with construction of the pipeline in the United States while the state of Nebraska works to determine an alternative route. “That’s the same amount of pollution as adding 4.8 million cars to our roads: an additional 27 million metric tons of carbon pollution,” said Gore, who commented in his role as founder and chairman of The Climate Reality Project. “24 hours from now, a team in Washington, DC will march into the Senate with 50 giant boxes, each holding 10,000 signatures. 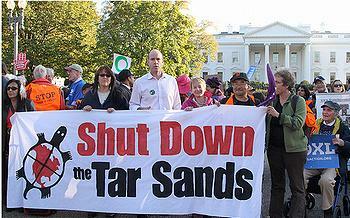 It will be a unified show of our power: our voices against the dollars of Big Oil,” Karpinsky said. After nearly three years of study, the U.S. State Department is conducting a further environmental impact study after the pipeline route specified in TransCanada’s proposal was criticized by the state of Nebraska for imperiling the Sand Hills region, which overlies the Ogllala aquifer – source of drinking and irrigation water for much of the Great Plains. Nevertheless, TransCanada is staging miles of pipe to build the line in a North Dakota field.